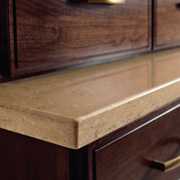 Signature Cabinetry & Remodeling offers a wide range of countertops to compliment your cabinets and style. Through our select vendors we can help you choose which natural surfaces are right for your lifestyle. Granite is one of the hardest natural materials on earth and can withstand heavy use. It comes in a wide variety of color and movement. Each slab of stone is slightly different so choosing your stone is as personal as you are. Though it is a porous stone, sealers are applied to keep anything from penetrating the surface. For a reasonable fee, granite can be treated with a long lasting sealer that last up to 15 years without regular yearly sealing. Marble and Onyx are also natural stones which can be used for counter top materials. These natural stones are mostly used as vanity counter tops. Both materials are softer than other natural stones and not desirable for the kitchen due to their delicate nature. Which I find a shame since both are naturally extremely and unusually beautiful. Many tile makers are cutting and using these stones alone or accompanied with other materials, like glass or travertine, to make different shaped tiles for backsplashes and other areas where tile would be used. We offer a large selection of colorful laminates by popular manufactures like Wilsonart and Formica. When laminates were first discovered, it was the greatest product ever invented. It was durable, colorful, plentiful, and inexpensive. Today, with other products to choose from, it isn’t as popular. It is almost half the expense of pricey stone, and is still as colorful and durable as it was 30 years ago. We also offer fabricated solid surfaces which include Corian, Formica and Avonite. 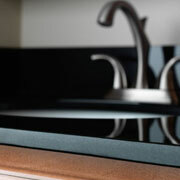 Corian was the leader and first made by Dupont using a blend of polyester and acrylic. It is still a leader in the solid surface industry. For anyone who is looking for a specific color, you will find what you are looking for in this arena. Since the color goes all the way through the product, it can be easily sanded and buffed back to it’s original state if it is scratched, chipped or stained. 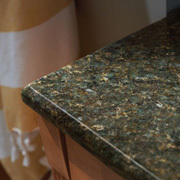 It is less expensive than granite and is non porous which means it is hygienic, and has little or no maintenance. It is close in price to a lower priced granite. Avonite, another solid surface material, has several selections in their product line which lends itself to under lit lumination. This trendy material is slight pricier than the regular material. Quartz has become the most popular product on the market today. Manufacturers of quartz included Cambria, Ceasar Stone, Silestone, Hanstone, Zodiac. Quartz is a manmade material consisting mostly of quartz-based product and combined with resins, some binding agents and occasional pigments that makes the product superior to any other product. It is highly dense, nonporous, and hygienic. It doesn’t require maintenance or sealing. Unlike quartzite, it is unlikely to etch. It is able to withstand high temperatures, up to around 300 degrees F. Similar to Corian, it has a large variety of colors to choose from. As quartz becomes more popular, the manufactures work at changing the appearance to resemble natural stone with an added feature of movement. The cost is around the same price as a midrange granite. Another natural stone gaining popularity is Quartzite. Quartzite, like granite, is a very hard, dense stone. It resists heat and hard to stain. Quartzite is made from sandstone and quartz together under extreme heat and pressure. The empty grains of sandstone are filled with quartz. The process actually makes quartzite harder than quartz. The downside of quartzite is the slab you choose may have some etching. When shopping for your slab, carefully look at it from all angles. If the slab has etching, it will be obvious in certain lights. It is a natural characteristic of quartzite and does not effect the durability of the stone. It is only a downside if you don’t like the look. 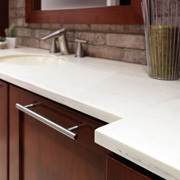 The market for different colors and design for counter top material has spun a new breed of quartzite. If you find a piece of quartzite that has an awestruck design with magnificent color, you may not be looking at the natural state of the stone. These slabs of unusual colors may have been color enhanced . Your sales person should be able to tell you whether they have been altered. This process is new and my thoughts on it is, it’s a high price to pay if it begins to fade in 5 years. If you find one of these hybrids and want to take the chance on it, get some kind of a guarantee in writing. Many people ask us which material, granite or quartz is best for counter top material. They are both excellent materials, if they both were weighed on a Mohs scale of hardness (10), with 10 being the hardest, granite measures between 6 -6.5; whereas quartzite measures around 7. I feel that since the counter top makes up a large part of the finished look of your new kitchen or bath, that choosing the right design and color would be my first decision. Then choose the one that offers what you want. The difference in cost in the materials in either slabs or tiles will be reflected through the availability of colors and location. Grothouse wood countertops and solid wood surfaces are crafted from a virtual forest of wood choices and an array of edge profiles, and design options. Butcher block countertops are sealed with Grothouse Original Oil™ finish and perfect for an aesthetic and functional food preparation surface. 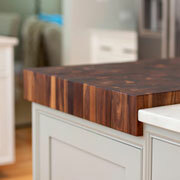 Grothouse wood bar tops are used in commercial and residential bars throughout the United States. Their exclusive Durata® Finish assures a protective waterproof surface. All items are custom made in the USA by our master craftsmen.